My exploration of the East European immigrants experience in Mexico City began in a conversation with author Ilan Stavans. This lively encounter inspired my visit to the “Centro Historico” where another unique encounter, this time with Monica Unikel, transported me to the days when the first Jewish immigrants arrived in the city. Monica’s unique Jewish heritage, Mexican birthright and background in history combined into a unique career as tour guide with a concentration Mexico’s Jewish past. The kaleidoscopic sights and sounds of modern metropolis Mexico City is grounded in the archaeological remnants of the Aztec empire, historic structures of the Spanish conquistadors and in the faces of modern Mexican citizens. Blossoming Jacaranda trees lined the streets of the city upon landing. The spiked light violet flowers of these lovely ornamental shade trees defined my first impressions. Our tour with Monica revealed layers of history and clashes of culture which are majestically rendered in the details of this design. The skills of artisans from native and immigrant groups are all employed in reflecting the tiny but influential contributions of the Jewish immigrants to this Mesoamerican terrain and bless the beloved couple with the gifts of this fascinating place on earth. 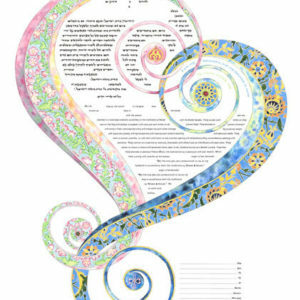 With our “One Heart” ketubah now nearly sold out we've decided to offer a beautifully revised version of this brilliantly designed Ketubah graphic. 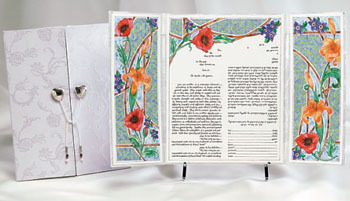 “One Heart Second Edition” speaks to the heart of love and marriage in the distinctive signature style of Amy's contemporary vein of illuminated manuscripts. 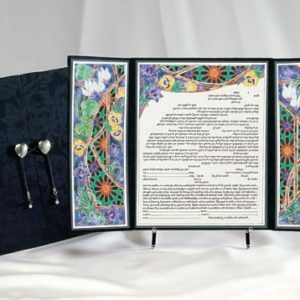 With an airy and quieter interpretation of this well loved ketubah illumination “One Heart Second Edition” affirms the effortless effort of a master work and reiterates the serendipity and pleasure of hearts united in love. 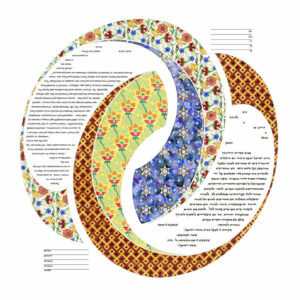 This ketubah design by Amy Fagin is reminiscent of Majolica, the 14th century decorative pottery glaze art form. Introduced from Moorish Spain by way of Majorca and produced in Italy, it is typically rendered in five colors: cobalt blue, antimony yellow, iron red, copper green and manganese purple, painted on a white background. 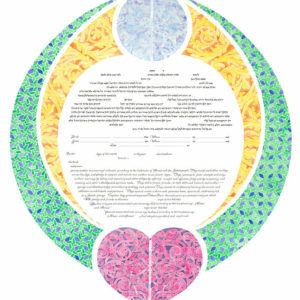 A rainbow of colors define this design. All of our actions begin with a thought from head to heart. This timeless Illumination celebrates the theme of love and tender embrace, gentle protection, cooperation, adoration and quite contemplation. 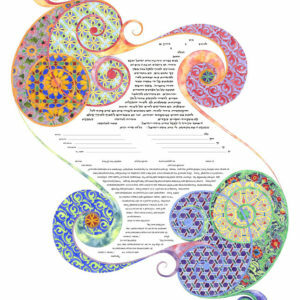 This exhilarating Ketubah/Wedding Illumination explores the theme of love everlasting. Designed for a lifetime of appreciation, this kinetic composition renders the moment in the life of the ripened flower bud, just bursting into full bloom. 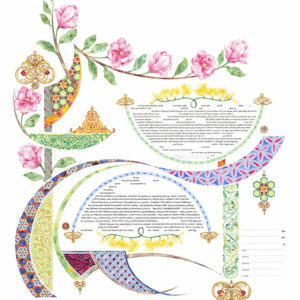 All the promise, celebration and joy of Your Wedding Day and Marriage Vows are conserved in everlasting beauty with this Limited Edition Giclee Fine Art Illumination. The “Double Ring” design is an ageless and universally cherished symbol of two lives joined into one in love and marriage. Illuminated in the completely unique signature style of 20th Century Illuminations this contemporary rendering of the double ring design shines in its timeless accounting of the nature of a union bound in love. 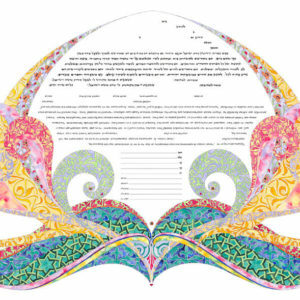 Celebrating 2500 years of ketubah illumination Amy Fagin's contemporary line of fine art ketubot delight couples around the world with finely crafted illuminations that speak to the heart and soul of love and marriage. 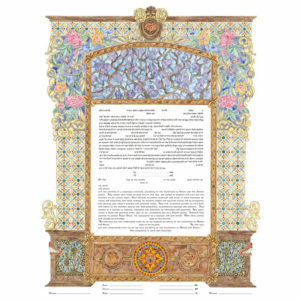 This ketubah was released in 2009 with a run of 750. Like a flowing stream reflecting the luminous facets of a union springing from abiding love, “You and I” illumination conveys the subtle influences which shape an intimate relationship. 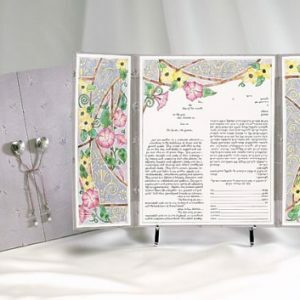 This mirror image composition delicately embraces your marriage vows and expresses the concepts of individuality of spirit and convergence of being which a loving partnership embodies. Thoughts and ideas spring from the core of the relationship as a seed planted in fertile soil that flourishes in a nourishing environment. “In our minds we will stay here, always, in love, You and I”. The health and diversity of our planet depends on the stewardship of our natural resources by all people. The promises of a marriage are cradled within the intricate and delicate web of life upon which we depend for our very existence. 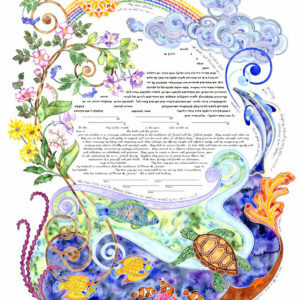 Our exhilarating “Wind Song” ketubah expresses a chorus of celebration from the wealth of our ocean’s mysteries to the blessings of sun, rain and the plant kingdom. 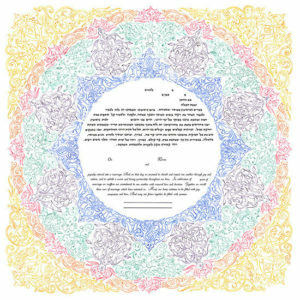 Your promise is also our promise and with the purchase of our “Wind Song” illuminated ketubah we will donate a portion of the proceeds to the Ocean Conservancy to help preserve the health of our oceans. Our contribution campaigns are our way of thanking you for your patronage and working on behalf of the health of our planet, which we all share. Light a candle! Arrange a spray of cut flowers! Fill a glass of wine! Absorb yourself in the reflection of light in a pool of water! Admire a beautiful work of art and celebrate your beloved with Pure Joy!